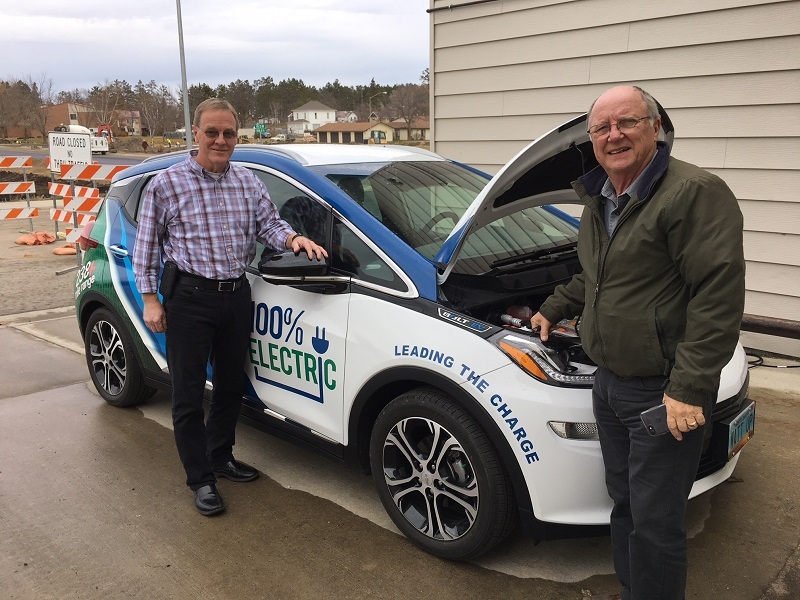 My final Co-op Month celebration with the Minnkota Bolt would take me on a 94-mile journey to Bagley, Minn., where Clearwater-Polk Electric had invited me to spend one of two Co-op Open House days. On Tuesday and Wednesday, the co-op urged its members to drop in, pour a cup of coffee and pull up a seat to chat with General Manager Bruce Bjerke and his member services team. The best part of all? A spread of homemade pie and doughnuts that would pick up blue ribbons at any county fair in the state. But more on that later. I left for the 188-mile round trip drive with 192 miles of expected range. Normally, I would be a little nervous about that math, but I knew it would be a sunny and calm day. I also knew I could leverage a bit of seat heat to save on battery-draining climate control. The final fear destroyer was the knowledge I could plug in at the co-op for a low level charge over the six hours I'd be stationed there. Range anxiety? Please. I'm getting over that. I arrived in Bagley with 105 miles of range and plugged in for a little extra juice. The Bolt was right next to the entrance that members would use to come in for pie. Perfect. Come for the pie, stay for the electric vehicle. I had a prime desk situation for the open house. I was within arm's reach of pie and people had to come talk to me to get their coffee and dessert. 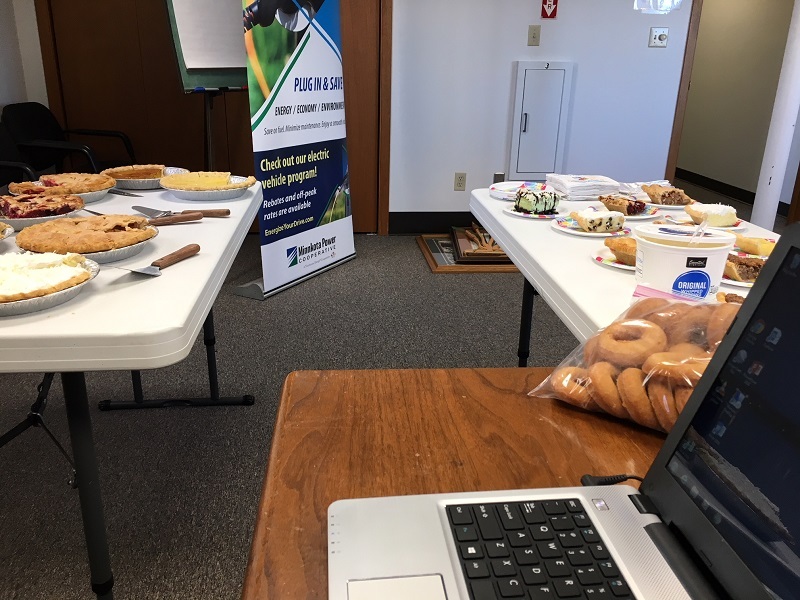 My work station for the day was, no exaggeration, surrounded by bags of homemade, old-fashioned cake doughnuts and a variety of pies. These tasty tarts are baked fresh from scratch every year by Member Service Representative Deanna Lefebvre. The woman is a pie pro. I tried the apple pie, the strawberry rhubarb pie and the crème de menthe cheesecake (please, don't judge me), but she also prepared pecan, sour cream raisin, cherry, blueberry, coconut cream, lemon and pumpkin. Readers, I will stop going on about the pie, but know this – Deanna is an artist. She even gave me some crust secrets. I'll never tell. 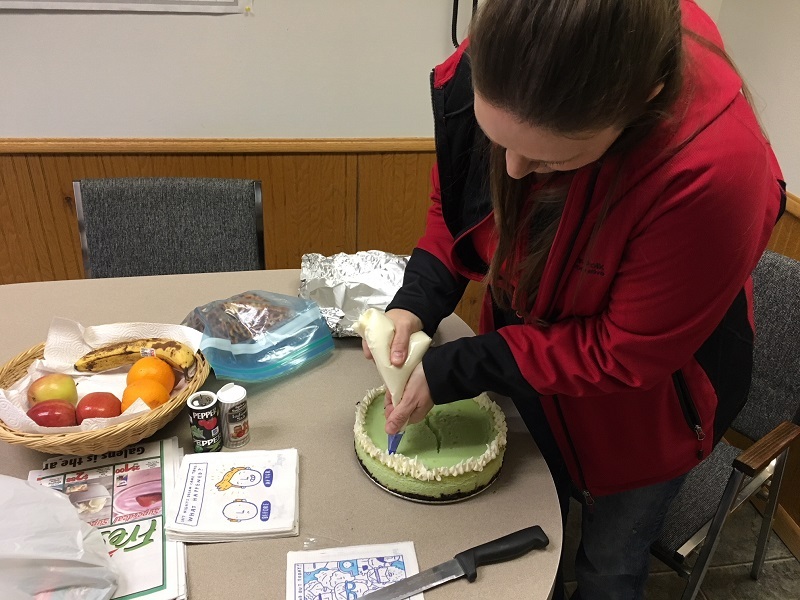 I caught a behind-the-scenes look at Deanna putting the final touches on her crème de menthe cheesecake. Pies aside, one of my favorite parts of the day was meeting all the lovely members who stopped by for the open house. They curiously asked about the electric vehicle (which many noted they saw advertised in the co-op's newsletter and on the radio) and let me join in their casual conversations about road construction, the late harvest and how working at the co-op decades ago was different than the present. 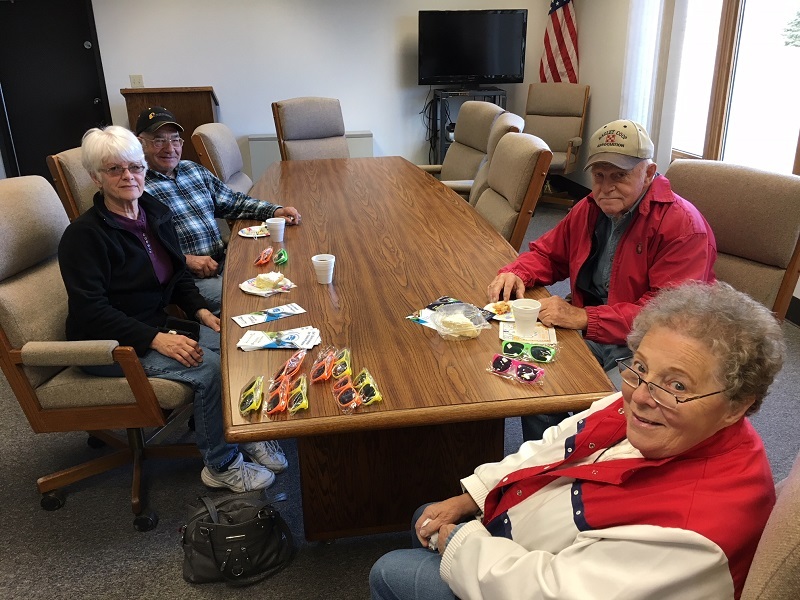 Members who didn't know each other found common ground over discovering mutual connections from old hometowns and high schools – a favorite hobby in northern Minnesota and North Dakota. 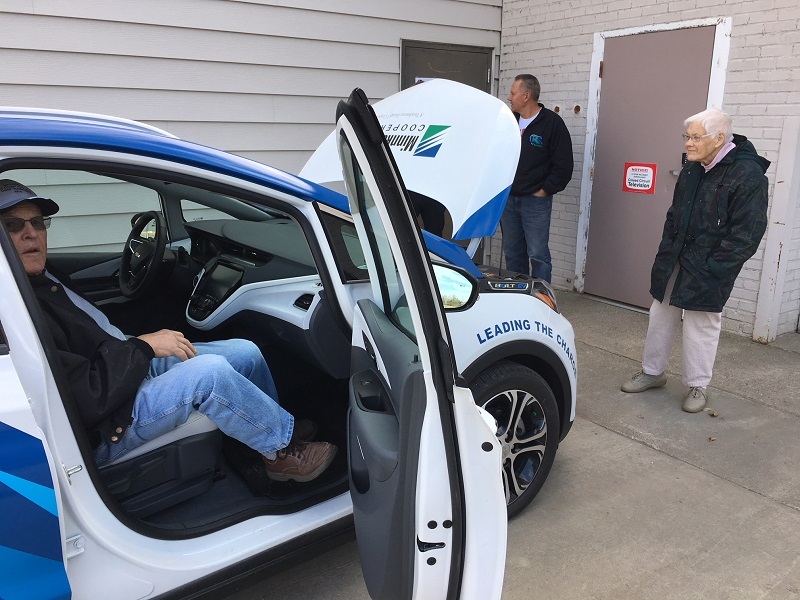 Members came from communities all over the Clearwater-Polk Electric service area to catch up with friends and learn about electric vehicles. When it came to EVs, they picked my brain about my experiences so far in the cold and snow, which are pretty limited at this point. 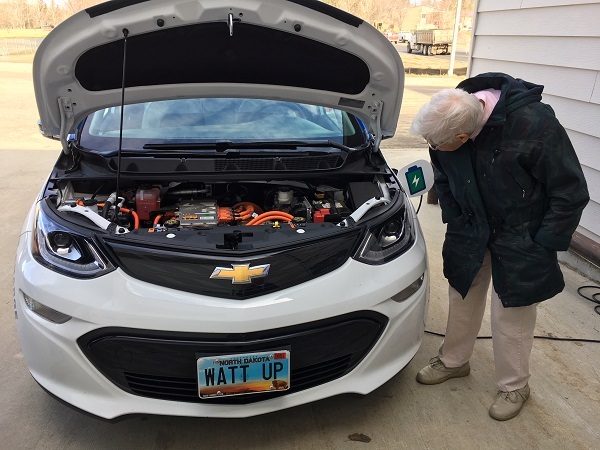 Some were surprised that the car made it all the way from Grand Forks and were even more surprised that it could also make it back on a single charge. As one gentleman left the room, he warmly told me, "Don't get electrocuted by that car. Stay out of the water!" I'll be fine in the puddles, sir, and I plan to stay away from the lakes and rivers. 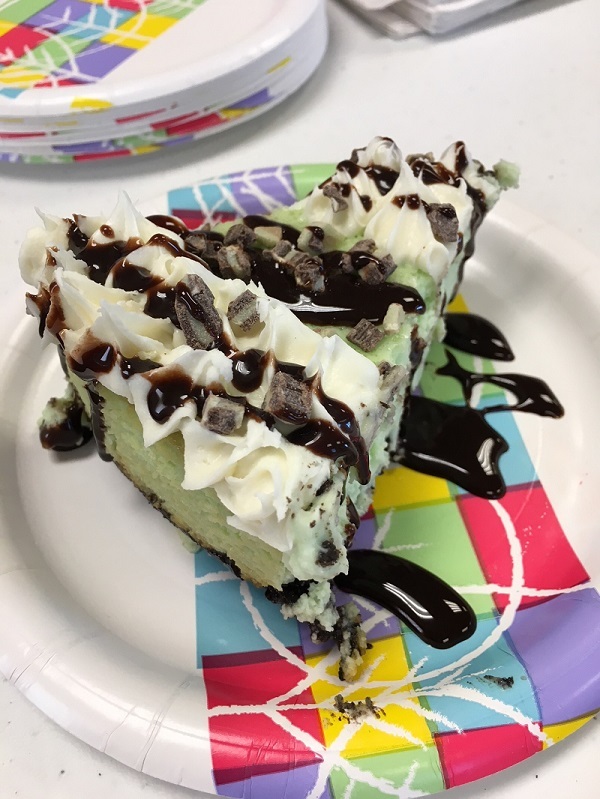 Many visitors wanted to top off their devilish dessert with a deeper look at the car, so we took the ten steps out the door and dove into the differences between hybrid and all-electric models, range variances based on temperature, and the falling cost of batteries and EV models. "If I sell my soybeans, I could buy one of these!" one farmer joked. You really have to get into a Chevy Bolt to realize how comfortable and spacious it is. When it gets colder, I should have those heated seats fired up for guests! Clearwater-Polk General Manager Bruce Bjerke (left) and area publisher Richard Richards (right) take a moment for a photo with the Bolt. A huge thank you to Bruce and his staff for being incredible hosts! Soon it was time to hit the road again, so with sugar in my veins and 127 miles of charge "in the tank," I said goodbye to the awesome Clearwater-Polk team. Co-op Month may soon be over, but my experiences over the past three weeks at member appreciation events in Red Lake Falls, Mahnomen, Roseau and Bagley make me so proud to be a part of this cooperative community.